Rising exclusion rates indicate the continuing marginalisation of many young people in education in the UK. Working-class boys, children living in poverty, and children with additional/special educational needs are among those experiencing a disproportionate rate of exclusion. This book traces the processes of exclusion and alienation from school and relates this to a changing social and economic context. 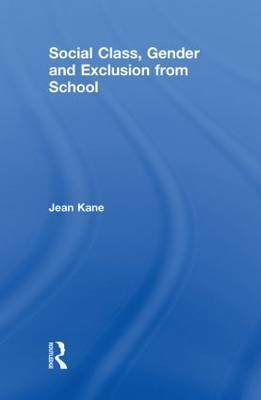 Jean Kane argues that policy on schooling, including curricular reform, needs to be re-connected to the broad political pursuit of social justice, and presents compelling case studies of excluded pupils, showing the multi-faceted identities of pupils, with a particular focus on masculine and feminine identities. the meanings of school exclusionssocial class, gender and schoolingsocial identities of excluded pupilsnegotiating identities in school: moving towards exclusionexclusions and young people's livesimproving participation in schooling. Providing fascinating reading for teachers, social workers, researchers and policy-makers this book considers how educational disadvantage might be addressed through recognition of the gender and class identities of pupils.